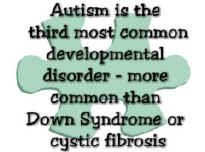 Have you ever wondered what the term "autism" or "autistic disorder" means? 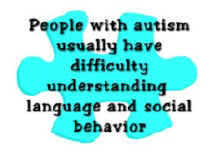 Wikipedia also states that autism "affects information processing in the brain by altering how nerve cells and their synapses connect and organize; how this occurs is not well understood." 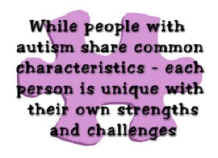 Autism is "often described as a 'puzzling' disorder " (PBS), which is represented by the puzzle pieces on this page. Autistic people also lack the ability to imagine, or pretend with objects. For example, a normal child will see a sand bucket like a castle; but the autistic child would throw and pour sand out of the bucket. As a result, specific forms of repetitive activities, habits, or specific interests are replaced. Since Matthew is autistic, knitting has become one of his favorite activities and specific interests. In fact, Matthew has taught himself how to knit watching videos and reading books. He now knits every day because it calms him and helps him to have a sense of achievement or accomplishment. He always says after he finishes his project, "Look at this!" and smiles. Moreso, he has a desire to sell his scarves on the Internet in order to have an income to save and buy the things he wants. In this way, his knitting motivates him to fulfill and learn about financial goals. If you would like to read more about Matthew, please visit the "About Matt" page. 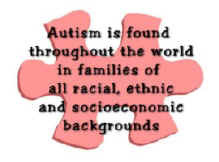 To learn more about the causes, symptoms, and treatments for autism, please visit the following links below. Need to do research on autism? Copyright © 2007-2018 Mattknits.com All Rights Reserved.